She'd been hiding them in bushes during a huge rainstorm. 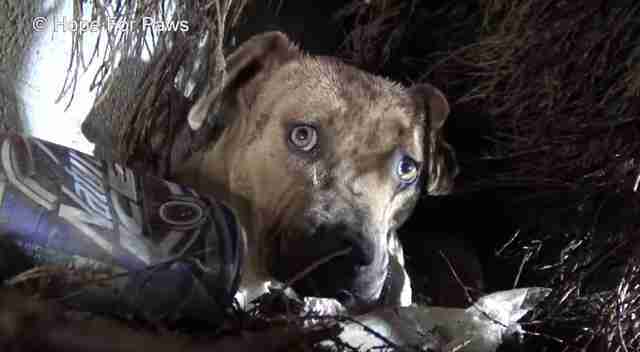 When Rainbow the homeless pit bull had puppies, she tried desperately to protect them from life on the streets. 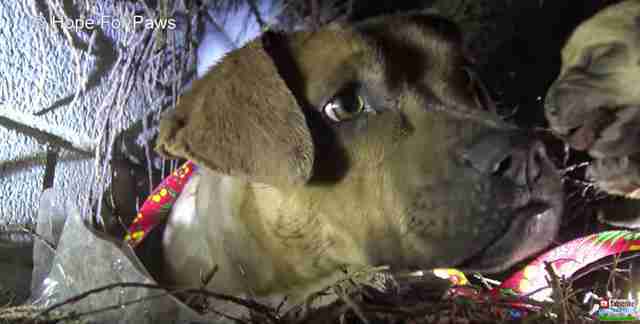 But only 48 hours after giving birth, a huge rain storm struck California, and Rainbow and her puppies were immediately in danger. Hope for Paws found out about the little family, and drove three and a half hours to try and help them. 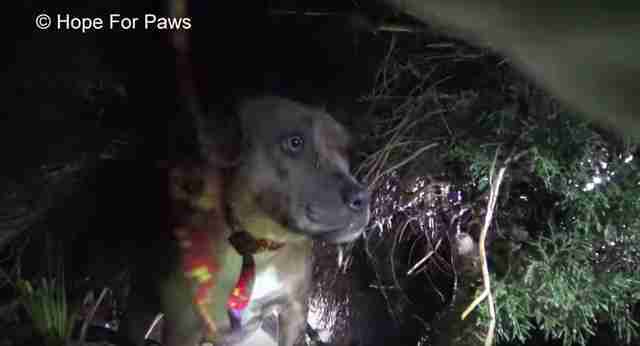 It was completely dark when the group of rescuers arrived, and it was hard to locate Rainbow and her puppies at first, hiding somewhere in a patch of thick bushes. 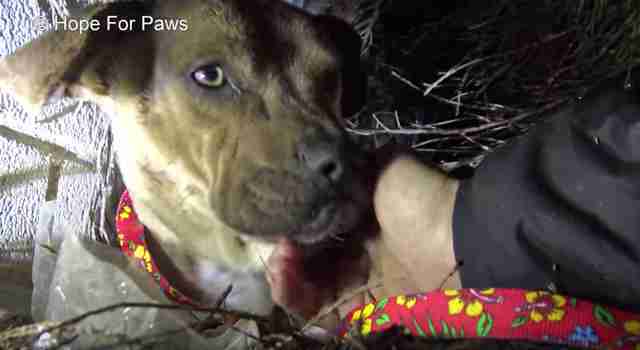 "This is a crazy, crazy situation," Eldad Hagar, founder of Hope for Paws, said in a video about the rescue. Eventually, though, they found them all huddled up together deep in the bushes, Rainbow trying as hard as she could to keep her babies warm. For the past several months, people in the area had been trying to rescue Rainbow, but she would always get scared and run away. 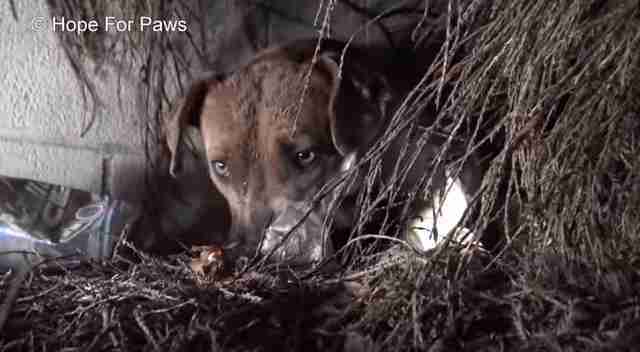 Once she had puppies to protect, however, she seemed to realize that she needed help. Hagar made some space and scooted through the bushes to reach Rainbow. She had plenty of room to run away, but instead, chose to face her fears and stay with her babies. Hagar spent some time getting to know Rainbow, feeding her and gaining her trust, before finally attempting to pick up the first baby. As soon as Hagar lifted Rainbow's baby away from her, she began licking the little puppy, as if she wanted to tell him it would be OK.
... and one by one, she kissed each one as she watched them go away. Finally, when there was only one puppy left, Rainbow began to sit up, as if she knew that now that all her babies were safe, it was time for her to be rescued, too. 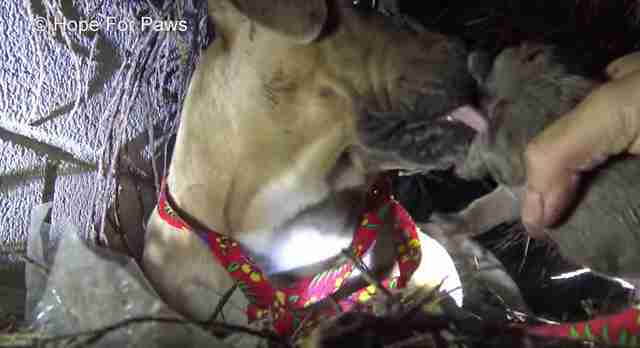 Hagar gently pulled Rainbow out of the bushes, and loaded her into a cage so they could take her and her puppies out of the rain and away to safety. Back in the car on the way to the vet, everyone was absolutely soaked, but so relieved that Rainbow and her puppies were finally safe. Due to the crazy storm, the power was out at the vet's office, so the rescuers had to work by the light of flashlights, getting the little family cleaned and checked out. Finally, Rainbow was able to settle in and take care of her eight puppies again. 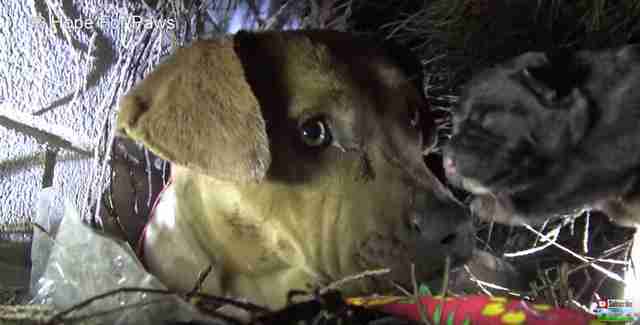 Rescuers named them Thunder, Breezy, Misty, Raindrop, Flash, Bolt, Stormy and Droplet. Despite having run away from people for so long, Rainbow warmed up to her rescuers almost immediately, and became a giant lovebug of a dog who just wanted to make up for all the attention and love she'd been missing. Rainbow and her puppies are now thriving together in foster care, and will soon be ready to go off and find their forever families. The puppies are growing bigger every day and Rainbow finally feels safe around people, and no one could have asked for a happier ending for this little family. If you'd like to adopt Rainbow or one of her puppies, you can contact The Little Red Dog for more information.